Remember when you were a kid and the magic marker boxes always had some sort of really elaborate drawing on the back? As if to say, "Buy these eight wide-tip Mr. Sketches and you, too, will be able to create a photorealistic portrait of a scarlet macaw"? But when you bought the markers and tried to copy the picture, it always came out as a stupid magic marker bird? You might have gotten more realistic results by coloring directly on a real animal. Some scientists tried this, and changed the birds' entire quality of life. In North American barn swallows (Hirundo rustica erythrogaster), males and females with darker-tinted bellies are able to have more young. But they don't get their tan tummies by lying in a UV bed. The birds develop their color months before the breeding season starts, and it depends on both genetics and their health at the time. Biologists call dark bellies on barn swallows an "ornament," like long tails or showy sets of antlers in other species. These traits may not serve a practical purpose, but they can advertise to potential mates how healthy or hardy the animal lugging that long tail around is. 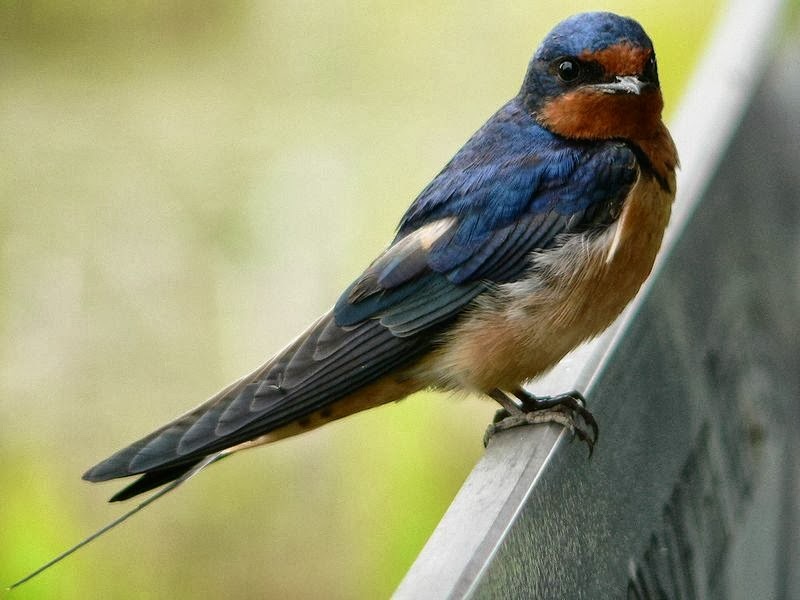 Ecologist Maren Vitousek at the University of Colorado, Boulder, and her colleagues wanted to know whether barn swallows' ornamental belly feathers could also work in the other direction. A bird's health or fitness affects the color of the feathers—but can the color of the feathers also affect the bird's health? The researchers captured 60 female barn swallows in Colorado, shortly before the time of year when the birds would be pairing off with mates. Using marker, they colored in the entire belly area of half the birds. The shade—PrismaColor light walnut no. 3507—was within the natural range of hues for barn swallows. Then the scientists sent the newly made-over birds back out into the world. About a week later, the scientists began to recapture the birds. (They found 36 out of the original 60.) Ordinary, uncolored birds had higher levels of oxidative damage in their blood than when they were first captured. Their bodies had been under stress. But birds with darkened feathers actually had less oxidative damage than before. Vitousek, who's now at Cornell University, thinks coloring in female birds' belly feathers made their lives easier. "Darker plumage may signal social status in barn swallows," as it does in some similar birds, she says. If so, other birds may have judged their tanned peers to be of higher status, and possibly more likely to win a fight. "As a result, they may be challenged less," she says. Even though birds or other animals sometimes develop their showy traits well before the mating season, this kind of feedback loop would let these traits remain honest signals of how healthy an animal is. Fitter birds make darker feathers, and darker feathers seem to keep birds healthier by sparing them harassment. "What we are finding is that the appearance of an individual alone can also influence physiological state—and probably fitness—by changing social interactions," Vitousek says. And all it takes to change a bird's social status is a quick pass with magic marker. Maybe it can be a post-retirement hobby for that Mr. Sketch package artist. This post has been submitted to the 2013 blog contest held by the National Evolutionary Synthesis Center (NESCent). So can we all get a bunch of birds and marker their bellies?